...the third in a series of zero emission concepts its chairman Herbert Diess is touting for production as part of a broad based future proofing strategy aimed at netting the German car maker up to 1 million electric car sales globally by the middle of the next decade. One of the stars of this year’s Shanghai motor show, the four-wheel drive I.D. Crozz follows the earlier I.D. hatchback and I.D. Buzz, with which it shares its modular platform, electric driveline, newly designed chassis and is planned to be produced alongside from 2020 onwards. Running two electric motors with a combined output of 302bhp and an 83kWh battery, the high riding four seater is claimed to boasts 0-62mph time of less than 6.0secs and an overall range of up to 311 miles. 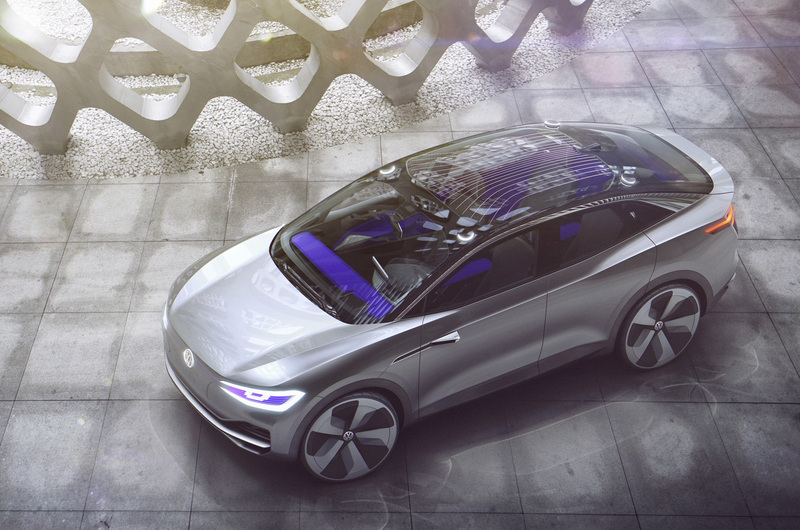 As well as acting as a showcase for Volkswagen’s future electric driveline technology, the I.D. Crozz also highlights the sort of autonomous driving features that are likely to begin appearing on the company’s more up-market models within the next decade. Included among its self driving technology are four laser scanners, which automatically deploy from each corner of the new concept’s heavily curved roof when the driver switches from manual to autonomous, or what Volkswagen describes as I.D. Pilot, mode. The latest of Volkswagen’s post Dieselgate electric car concepts takes the form of a contemporary styled crossover that sets out to combine the dynamic lines of a modern day sportscar together with the all terrain capability of a dedicated off-roader. Featuring two conventional front hinged doors up front and a pair of cantilever style doors at the rear, it is said to offer interior space on par with the recently unveiled Tiguan Allspace – a new long wheelbase version of Volkswagen’s best selling SUV model set to reach the UK this summer. At 4625mm in length, 1891mm in width and 1609mm in height, the I.D. Crozz is a considerable 316mm shorter, 85mm narrower and 354mm lower than the I.D. Buzz. The new crossover also rides on a wheelbase that is 527mm shorter than its retro inspired MPV sibling at 2773mm. The I.D. Crozz is propelled by a pair of electric motors – one mounted within the front axle assembly developing 101bhp and a second, larger unit at the rear with 201bhp – providing a combined output of 302bhp. This is 67bhp less than that delivered by the dual electric motors in the four-wheel drive I.D. Buzz revealed at the Detroit motor show in January, but 134bhp more than that developed by the single motor used by the rear-wheel drive I.D. hatchback unveiled at the Paris motor show last September. Drive is channeled to the respective axles via separate fix ratio gearboxes and a so-called electric propshaft that is capable of transferring power between each axle dependent on the prevailing grip and traction. Energy used to power the electric motors is stowed in an 83kWh battery mounted within the floor. It provides the new crossover with a claimed range of 311 miles, or some 125 miles more than the newly facelifted e-Golf, on the existing European test cycle. Volkswagen says the lithium ion unit, similar in shape to those already seen in the I.D. hatchback and I.D. Buzz, can be charged to an 80 per cent state within 30 minutes using a 150kW electrical system. Together with a 0-62mph time of less than 6.0sec, Volkswagen also quotes a 112mph top speed for the new concept. As with all of Volkswagen’s more recent electric car concepts, the I.D. Crozz has been conceived to offer the choice between manual and autonomous driving modes. In manual mode an LED graphic within the front section and roof is illuminated in a light blue hue. In autonomous driving mode, the LED graphic switches to a violet colour. At the same time, four laser scanners integrated into the roof are deployed to enable the I.D. Crozz to detect other road users in combination with a range of proximity sensing technology, including both ultrasonic and radar sensors as well as front stereo and side-view cameras. Underpinning the latest Volkswagen concept car is a newly developed chassis that employs a MacPherson strut front and six-link rear suspension with variable damping control. Excellent wheel clearance within the front wheel wells, owing to the inboard mounting of the electrical engine within the central part of the axle assemble, allows for a relatively tight 10.5 metre turning cycle. Volkswagen also claims a front-to-rear weight distribution of 48:52, providing the basis for what it describes as “handling characteristics on par with the Golf GTi”. Volkswagen has unveiled the new electric powered I.D. Crozz - the third in a series of zero emission concepts its chairman Herbert Diess is touting for production as part of a broad based future proofing strategy aimed at netting the German car maker up to 1 million electric car sales globally by the middle of the next decade. 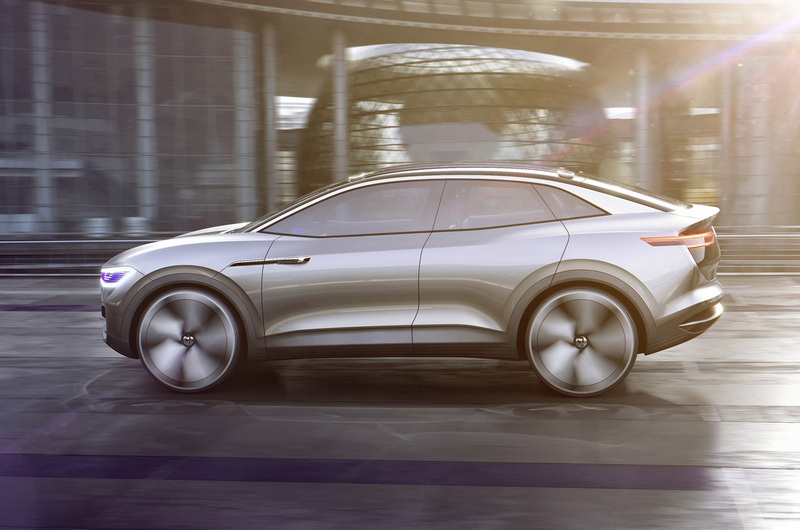 As well as acting as a showcase for Volkswagen’s future electric driveline technology, the I.D. Crozz also highlights the sort of autonomous driving features that are likely to begin appearing on the company’s more up-market models within the next decade. Included among its self driving technology are four laser scanners, which automatically deploy from each corner of the new concept’s heavily curved roof when the driver switches from manual to autonomous, or what Volkswagen describes as I.D. Pilot, mode. The latest of Volkswagen’s post Dieselgate electric car concepts takes the form of a contemporary styled crossover that sets out to combine the dynamic lines of a modern day sportscar together with the all terrain capability of a dedicated off-roader. Featuring two conventional front hinged doors up front and a pair of cantilever style doors at the rear, it is said to offer interior space on par with the recently unveiled Tiguan Allspace – a new long wheelbase version of Volkswagen’s best selling SUV model set to reach the UK this summer. The I.D. Crozz is propelled by a pair of electric motors – one mounted within the front axle assembly developing 101bhp and a second, larger unit at the rear with 201bhp – providing a combined output of 302bhp. This is 67bhp less than that delivered by the dual electric motors in the four-wheel drive I.D. Buzz revealed at the Detroit motor show in January, but 134bhp more than that developed by the single motor used by the rear-wheel drive I.D. hatchback unveiled at the Paris motor show last September. Energy used to power the electric motors is stowed in an 83kWh battery mounted within the floor. It provides the new crossover with a claimed range of 311 miles, or some 125 miles more than the newly facelifted e-Golf, on the existing European test cycle. 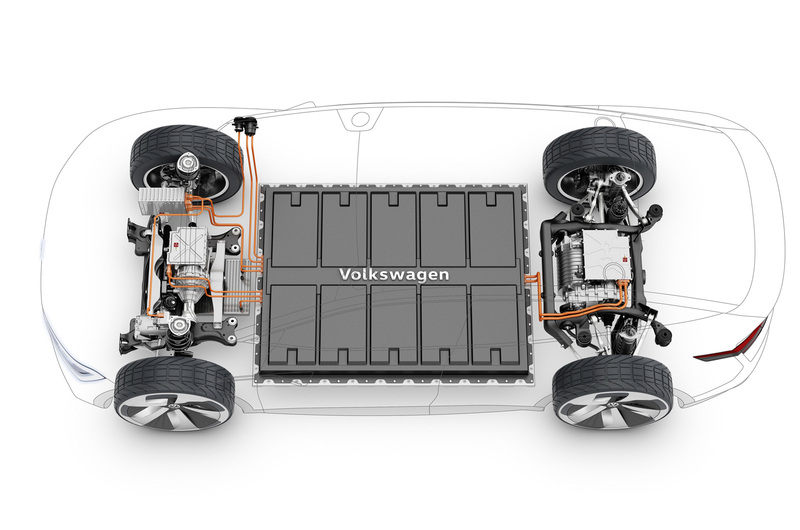 Volkswagen says the lithium ion unit, similar in shape to those already seen in the I.D. hatchback and I.D. Buzz, can be charged to an 80 per cent state within 30 minutes using a 150kW electrical system. As with all of Volkswagen’s more recent electric car concepts, the I.D. Crozz has been conceived to offer the choice between manual and autonomous driving modes. In manual mode an LED graphic within the front section and roof is illuminated in a light blue hue. In autonomous driving mode, the LED graphic switches to a violet colour. At the same time, four laser scanners integrated into the roof are deployed to enable the I.D. Crozz to detect other road users in combination with a range of proximity sensing technology, including both ultrasonic and radar sensors as well as front stereo and side-view cameras. Underpinning the latest Volkswagen concept car is a newly developed chassis that employs a MacPherson strut front and six-link rear suspension with variable damping control. Excellent wheel clearance within the front wheel wells, owing to the inboard mounting of the electrical engine within the central part of the axle assemble, allows for a relatively tight 10.5 metre turning cycle. Volkswagen also claims a front-to-rear weight distribution of 48:52, providing the basis for what it describes as “handling characteristics on par with the Golf GTi”. I really like the ID hatchback, a worthy Golf successor and a clean, simple, purposeful design in the Golf tradition. This to me looks less desirable and is perhaps going to be the Jetta equivalent. ...the shape of the concept! It has a four coupe feel to it. IMHO, the future Audi Q8 designers would do well to look over the shoulder of their VW Group sibling during car design class and copy as much of the shape of this concept as they can for their production Vehicle! If future Volkswagens are going to look like this, then what styling path are Audi going to follow, otherwise they'll all look the same. VW are making a great deal of noise about their future electric vehicle, but would you really trust them to develop the technology thouroughly? Recent history has shown how the group prefers the quick, short-cut solutions to grab sales, leaving the customer to face the consequences of underdeveloped solutions. Looks great, but VW will never create a production car which looks half as interesting. Can anyone think of a VW concept car which even resembles the production model? There was the XL1, and that's about it. Yep, I can only think of the Vauxhall Astra (the one that made Clarkson eat his hair) and the JLR Evoque - being almost identical to their concepts. The worst was the Dacia Duster debacle. Beautiful concept, terrible reality! This Terminalsecurity forum won't allow me to add a link - so just Google: 'Dacia Duster concept' It was one of the most gorgeous cars I've ever seen, and I was stupid enough to believe Dacia were going to market it.